February 22, STM received two Global Port Forum awards for its work with port information sharing and collaboration within the Sea Traffic Management (STM) concept. The two awards both addressed the innovation as such and the research & development associated to Port Collaborative Decision Making (PortCDM) as an emerging digital innovation. The motivation for the two prices built upon the idea of an innovation that stimulates collaboration, building on the capabilities of digitization, for enhanced situational awareness and thereby providing basis for port call optimization. A jury of seven distinguished people have selected the STM port concept as the innovation to award. 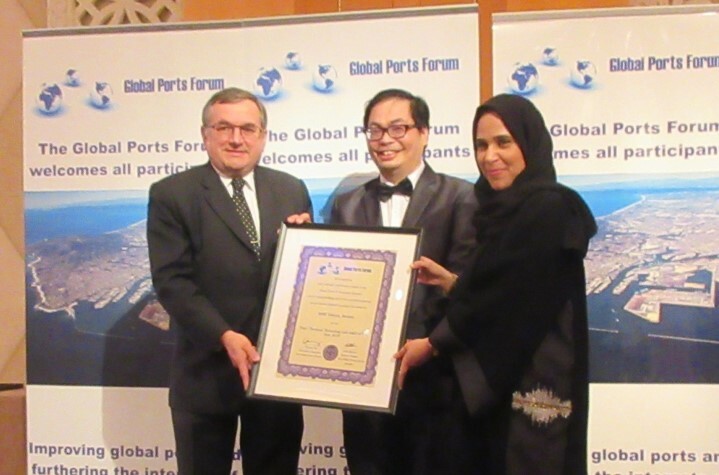 At the award ceremony, the Chairman of the Global Port Forum and the deputy transport minister of UAE recognized the awards for STM. “It is fantastic to get this recognition for this whole effort of making port operations more integrated in sea transports based on collaborative means that is being pursued within the STM validation project”, says associate professor Mikael Lind, RISE Viktoria and activity leader for PortCDM testbeds within the STM Validation Project, accepting the Innovation award above. Michael Bergmann, accepting the R&D award on behalf of STM. “This is an important step towards international harmonisation, through for example the utilization of the STM developed Port Call Message Format. The different stakeholders in sea transports are successively come to agreements of how to operationally and technically collaborate and communicate for sustainable sea transports globally. This recognition helps in bringing the maritime sector up to speed in adopting the opportunities that digitization enables“, says Michael Bergmann, secretary of the International PortCDM council.